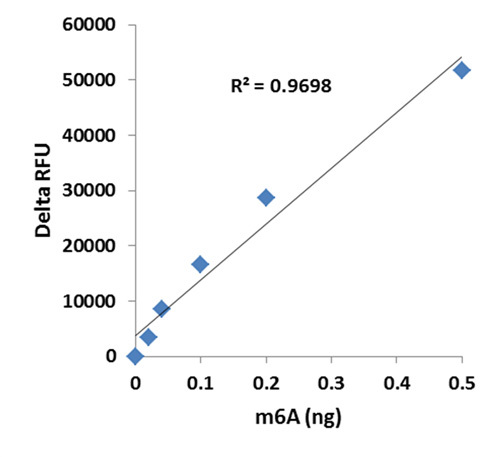 Schematic procedure of the EpiQuik™ m6A RNA Methylation Quantification Kit (Fluorometric). m6A standard control was added into the assay wells at different concentrations and then measured with the EpiQuik™ m6A RNA Methylation Quantification Kit (Fluorometric). Fluorometric assay with easy-to-follow steps for convenience and speed. The entire procedure can be completed within 3 hours and 45 minutes. 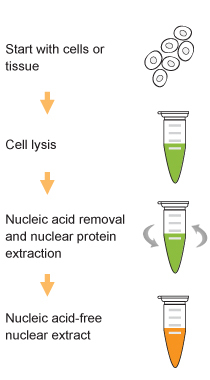 Unique binding solution allows that RNA >70 nts can be tightly bound to the wells, which enables quantification of m6A from both mRNA and nc-RNA such as tRNA, rRNA and snRNA. N6-methyladenosine (m6A) is the most common and abundant modification on RNA molecules present in eukaryotes. The m6A modification is catalyzed by a methyltransferase complex METTL3 and removed by the recently discovered m6A RNA demethylases FTO and ALKBH5, which catalyze m6A demethylation in an α-ketoglutarate (α-KG)- and Fe2+-dependent manner. It was shown that METTL3, FTO and ALKBH5 play important roles in many biological processes, ranging from development and metabolism to fertility. m6A accounts for more than 80% of all RNA base methylations and exists in various species. m6A is mainly distributed in mRNA and also occurs in non-coding RNA such as tRNA, rRNA and snRNA. The relative abundance of m6A in mRNA transcripts has been shown to affect RNA metabolism processes such as splicing, nuclear export, translation ability and stability and RNA transcription. Abnormal m6A methylation levels induced by defects in m6A RNA methylase and demethylase could lead to dysfunction of RNA and cause disease. For example, abnormally low levels of m6A in target mRNAs due to increased FTO activity in patients with FTO mutations, through an as-yet undefined pathway, contributes to the onset of obesity and related diseases. The dynamic and reversible chemical m6A modification on RNA may also serve as a novel epigenetic marker of profound biological significance. Therefore, more useful information for better understanding of m6A RNA methylation levels and distribution on RNA transcripts could benefit diagnostics and therapeutics of disease. This kit contains all reagents necessary for the quantification of m6A in RNA. 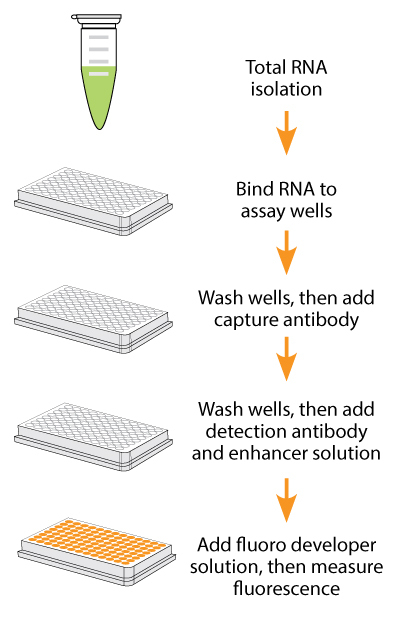 In this assay, total RNA is bound to strip wells using RNA high binding solution. m6A is detected using capture and detection antibodies. The detected signal is enhanced and then quantified fluorometrically by reading the RFU (relative fluorescence units) with a fluorescence spectrophotometer. The amount of m6A is proportional to the fluorescence intensity measured.